A table with an eyecatching centerpiece often sparks much conversation during a dinner. 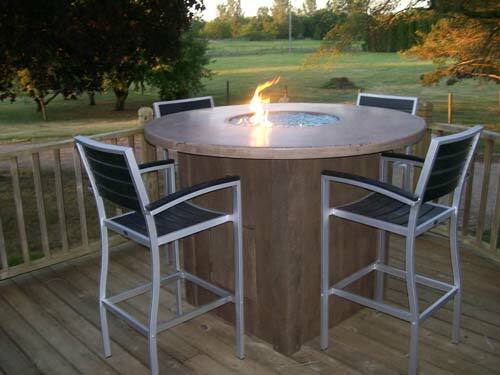 This concrete table with inset fire pit would certainly be a conversation starter on any patio or deck. Kevin and Duane Bontrager and the team at Bontrager Concrete Specialties, Inc., in Nappanee, Indiana, designed this table and base to be enjoyed for years to come. The approximately 48″ round and 2″ thick concrete top is comprised of Surecrete Design’s Xtreme Series Hybrid GFRC System and some styrofoam. The center of the table was formed to hold a metal pan (easily replaceable when worn out) in which flames are dispersed through decorative glass pieces. The flames in the middle of this table are the obvious focal point, but not to be overlooked is the custom concrete base with its uncanny resemblance to wood. The Bontrager team formed custom moulds and Xtreme Series Precast Mix was poured to 3/4” thickness. The base parts were folded together and fastened at the corners; custom concrete corner covers were also made to unify the look. There is also a door on one side to accomidate the exchange of the propane tank. Ecostain, a non-acidic, water-based concrete stain, was used to highlight the “grain” of the “wooden” base in order to give it an authentic appearance. The entire piece is coated in a matte finish sealer for a natural look and to guarantee easy maintenance and long-lasting durability.